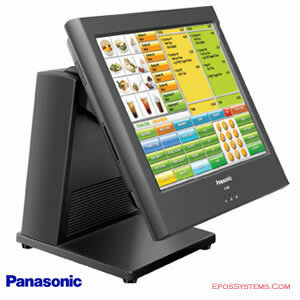 Below are listed our most popular EPOS touch screen terminals that are suitable for retail, hotel and restaurant use. These high quality branded touch screens are from internationally recognised manfuacturers like Sam4s, Panasonic, HiSense, Toshiba, ELO , Custom and HP. All these touchscreen tills have an integrated computer with processor, memory, motherboard and hard disk or SSD storage running various editions of Microsoft Windows, so there is no need for a separate base unit (except for the stand version of the Toshiba TCxWave). Volume discounts available. 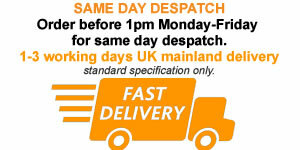 We ship throughout the UK. International orders welcome - please contact us for a shipping quote. 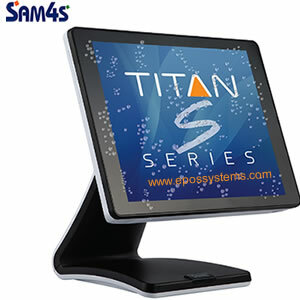 The Sam4s Titan S160 is an ultra-slim touchscreen POS terminal, with powerful performance specification, waterproof front and silent operation. Available in Black casing colour. 15" TFT LCD with Projective Capacitive Touchscreen, 2gb RAM, 64gb SSD, Intel Celeron Dual Core N2807 2.16ghz Processor. Windows 10 IoT pre-installed. Ports include 3 Serial, 4 USB, 1 VGA, 1 Audio, 1 LAN (10/100/1000mbps), 1 Drawer Port. Stand can be removed for wall mounting. The S260 is a faster model in the Sam4s Titan S series, with Intel Quad Core Celeron N3160 2.24Ghz processor. Available in either Black or White casing colour with contrasting trim. Modern design, with powerful specification, waterproof front and silent operation. 15" TFT LCD with Projective Capacitive Touchscreen, 2gb RAM, 64gb SSD. Windows 10 IoT pre-installed. The S360 is the fastest model in the Sam4s Titan S series with greater memory capacity. It has an Intel Quad Core Celeron J1900 2.43Ghz fanless processor and 4gb RAM as standard. Available in Black casing colour with contrasting trim. 15" TFT LCD with Projective Capacitive Touchscreen, 4gb RAM, 64gb SSD. Windows 10 IoT pre-installed. 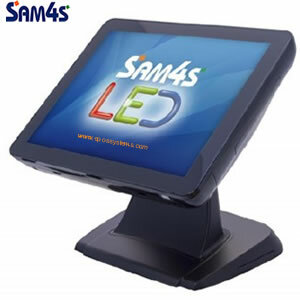 The Sam4s SPT-4856 is a solid build 15" touchscreen terminal with high gloss black finish and true flat LED touchscreen using projective capacitive multi touch technology. Intel Celeron N3160 2.24Ghz Quad Core fanless processor, 2Gb memory (upgradable to 16Gb) and 64gb SSD. Windows 10 IoT licence pre-installed. Stand can be removed for VESA wall mount bracket. New sleek design produced jointly by Toshiba and IBM with powerful performance specification and compact space-saving design. This stylish small-footprint terminal replaces the popular Toshiba WillPos ST-A20 and A10, and is offered here at a special UK price. 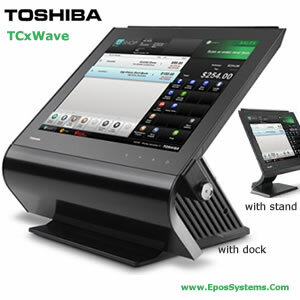 The Toshiba TCxWave will give your store a cosmetic edge and enhance the shopping experience for your customers. Visibility-enhanced 15inch (4:3 ratio) LED backlit LCD touchscreen with Projective Capacitive Touch Technology and 5-point Multi-Touch. The E3R edition comes fitted with a secure low-profile dock. Includes UK power supply. Intel Celeron Quad Core J1900 (2 GHz, 2M) Processor, 2GB Memory DDR3 1333 MHz (upto 8gb), 64GB SSD storage. Preloaded with Windows 7 POSReady. Ports on head unit include 10/100/1000MB Ethernet, 4 x USB, Audio Jack, 2x RS232 (RJ45). Ports on Dockable Base: 4 x USB, DisplayPort, 10/100/1000MB Ethernet. 1 Year On-Site Toshiba warranty. New compact design (replaces Titan 150/160) with true flat LED 15" touch screen providing brighter colours and a crisper picture. Available in Black or White gloss finish. Intel Celeron Quad Core N31060 2.2Gghz fanless processor, 2Gb memory (upgradable to 16Gb) and 64gb SSD. Windows 10 IoT licence pre-installed. 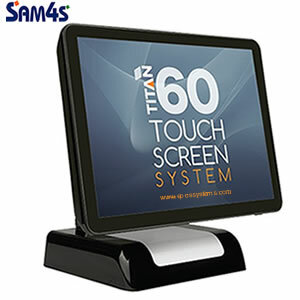 Modern elegant design 15" touch screen terminal with powerful specification. Intel Celeron P4500 1.86Ghz Dual Core processor, 2gb memory and 250gb hard drive. Windows POS Ready licence pre-installed. Upright model. 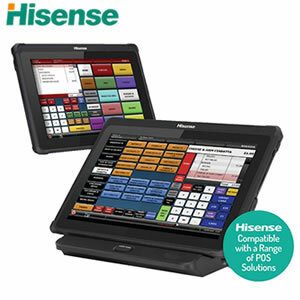 Lightweight POS system that can be used on your counter-top with its docking cradle and also lifted out for use as a wireless tablet. Rugged design with durable build for busy commercial environments. High efficiency battery to support long hours of operation. 10.1" wide screen. Intel Celeron N2807 1.58ghz processor, 32gb EMMC storage, 2gb RAM, Windows 10 Enterprise 64-bit. WiFi. Bluetooth. Docking station includes Ethernet, USB, Serial, VGA and Cash drawer ports. The HM518 features a bezel-free flat PCAP multi-touch screen. It has an integral magstripe reader and 1d barcode scanner. 3G GPS slot. IP54 rating to withstand water and dust ingress. Designed to handle 1.2m drops onto concrete. Advanced 15" touch screen solution with Projective Capacitive Touch technology. Intel N3160 Quad Core 2.24Ghz Burst Processor, 2gb memory and 64gb SSD. Windows 10 IoT pre-installed. 3 year warranty. * = All prices are stated excluding VAT and delivery. VAT will be added at 20%. Delivery to a UK Mainland address is £12. to confirm stock availability and/or for a shipping quote. DO YOU REQUIRE EPOS SOFTWARE TOO? 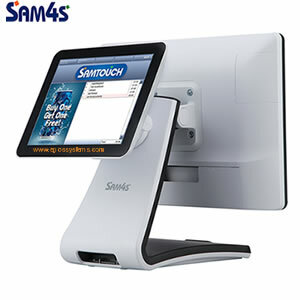 The touchscreen terminals listed above do not include any EPoS Software. If you require a complete solution with hardware, peripherals and application software with services for set up and training, please see our Package Solutions or EPOS Software. 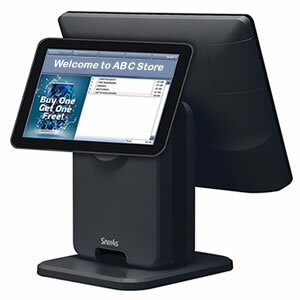 Our standard packages can be custom configured with your choice of alternative touchscreen terminal and other peripherals. Friday 19-April-2019 23:24 Our office is currently closed. We will be open again from 10am tomorrow.